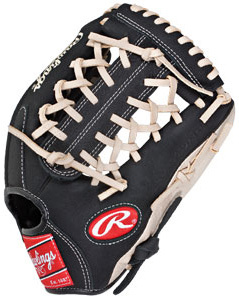 Rawlings Mark of a Pro 1150MT Baseball Glove 11.5"
This Mark of a Pro Series Pro Taper Model features the Modified Trap-Eze Web pattern, which is an extremely strong web that provides ball snagging functionality. With its 11 1/2" pattern, this glove is our most popular model and at the Pro Level is primarily used at the shortstop/pitcher position and at the collegiant/highschool level it can be used at 2nd, 3rd, and shortstop. The Mark of a Pro Series features an oiled leather shell and Pro Taper design which provides an improved fit offering increased control for younger players wanting a pro style pattern. Zero Shock sting palm pads are placed inside the glove to help sting reduction as well. Rawlings G205-15B Gamer Baseball Glove 11.75"
Mizuno GCP1ASBK Classic Pro Soft Pitcher Glove 12"
Wilson WTA03RB1712 A360 Series Baseball Glove 12"
Rawlings Sandlot Series First Base Mitt 12.5"
Rawlings G206-6BG Gamer Baseball Glove 12"
Rawlings Kris Bryant Select Pro Lite Youth Baseball Glove 11.5"